In 2009, the Information Commissioner’s Office raided a clandestine organisation known as the Consulting Association and found 3,200 names on a construction industry blacklist. In total 45 companies were found to be paying the organisation for ‘intelligence’ on workers including eight major companies now building Crossrail – Europe’s biggest construction project. The list included details of workers’ relationships, political affiliations, whether they were union members and even if they had worked on a site where industrial action had taken place, regardless of whether they were involved. The details of 200 environmental activists were also found. Construction is still the most dangerous industry in the country, seeing an average of three fatal accidents per week. Crossrail is the UK’s biggest construction project in a generation. It will cost £15 billion of public money and involves building nine new stations and a line spanning London. It will employ 14,000 workers at its height. If there’s any project that can set construction industry standards – for better or worse – it’s this one. Companies know it, and unions know it. And the fight for rights and sites is on. The conditions were gruelling, with workers on 12-hour shifts deep underground on tunnel-boring machines, at risk of lung disease due to dust inhalation, deafness from the scream of the machines, and Weil’s disease, caused by ingestion of infected rat urine. Workers were expected to wash their hands in buckets as there were no adequate washing facilities on many of the sites. They also organised their own sick fund to compensate for the derisory levels of sick pay from the employer. ‘No one abused it, everyone paid into it and it meant your mortgage could be covered if you fell ill,’ remembers Bob. ‘We all looked after each other’. The Jubilee line had to be ready for the queen’s jubilee and millennium celebrations, and this gave the workforce a large amount of leverage. The employers responded with blacklisting. They used firms like the Consulting Association to mark names, share information and stop people working on sites before they’d even started. Union officials and police were also part of the conspiracy, including spycops like Mark Jenner (aka Mark Cassidy), who infiltrated both the construction worker groups and anti-capitalist network Reclaim the Streets. The official exposure of the Consulting Association’s blacklist proved what many workers had long suspected: that they were deliberately being denied work, and through it access to workplaces where they could protect health and safety standards and organise for economic and social justice. Blacklisting meant collective punishment not just for workers but their families too, as many suffered mental breakdowns, divorce, and poverty over years of unemployment. The Blacklist Support Group was formed in the wake of the raid. It was organised and led by blacklisted workers themselves. Today it is still at the forefront of agile grassroots union activism in the UK and has mounted legal challenges to some of the companies involved. Last year Frank Morris, an electrician from Enfield who had been a shop steward on previous major construction projects in London, including the Olympic stadium, got a job on Crossrail for the Bam, Ferrovial and Kier (BFK) consortium. After raising concerns about dangerous cabling and an unstable gantry (which later collapsed) he was taken aside by management, labelled ‘a union man’ and sacked. Taking the fight to the gate, often on his own, he spent six months protesting before Unite’s organisation and leverage department began an anti-blacklisting campaign to get his job back and union access onto all Crossrail sites. Using multiple levels of leverage, including daily protests outside investors, partners, contractors, councils and HR managers’ homes, as well as giving evidence in government select committee hearings and lobbying US senators and UK MPs, Unite managed to cost BFK over £1 billion in lost work. The blacklisters were getting blacklisted. Their brands were becoming toxic. The rank and file continued to lead on direct action, blocking streets and roads in central London and Manchester. In one protest blacklisted electrician George Tapp was run down and suffered two broken legs. Still activists kept taking to the streets. 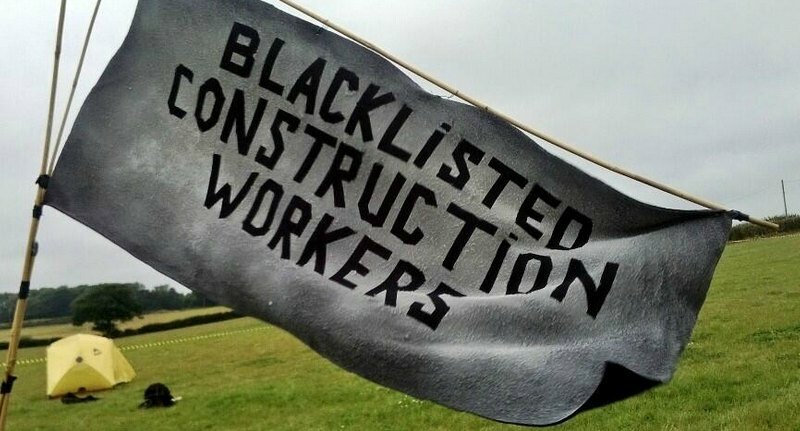 Will this kind of worker-led action make blacklisting too costly to continue? Crossrail will be the test case. Find out the latest from the Blacklist Support Group at www.hazards.org/blacklistblog/ or @daveblacklist on Twitter, and read about an upcoming day of action against blacklisting. Some names have been changed to prevent further blacklisting.